Those who remember the “NAKED GUN” movies, starring, amongst others, O.J.Simpson, may remember when Shakespeare’s “JULIUS CAESAR” was being staged in New York’s Central Park, and during the assassination scene the dumb cop outed with his Equaliser and blasted half the cast to Kingdom Come. 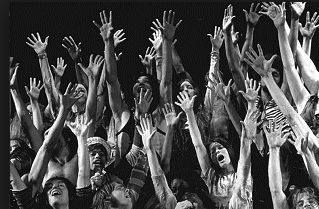 And those of you who read the Blog “Dulce et Decorum” may remember my description of going to see “HAIR” in the Swinging Sixties, which ended with the cast, naked as the days when they were born, swinging their naughty bits whilst dancing and singing about the Age of Aquarius. Well, I decided (or it was decided for me by my partner of that bygone age) that while we had wherewithall left, or anyatall , to swing, we should go to a show or three in London’s West End. So I found myself at a musical entertainment which ended with homage to ISIS and some fellow-traveller or travellers, called OSIRIS. Was I glad I was in a theatre rather than a park, and there were no obviously tooled-up police there.But the place was called the Coliseum, not necessarily comforting for a Christian. Come to think of it the show might get a Christian’s goat, as it appeared to dismiss Christianity as superstition. But to balance that, it purported to advocate reason and enlightenment, but presented as crazy, and your average man in the street wouldn’t have a clue what it was about, unless he had some sort of historical matrix. One clue was that the show was first staged in 1791, the year of publication of Paine’s Rights of Man, the year of the adoption of the US Constitution, and two years after the storming of the Bastille in Paris. The backdrop of Diderot’s Encyclopedia Francaise might have been a clue, if you were a bit of a history anorak like myself. And if you were on the Square, acquainted with funny handshakes, and rolling your trouserlegs up when not fording a stream, you might reckon that Freemasonry was involved somewhere. And you’d need to know that in 1791 Freemasonry was said to be progressive, even revolutionary, and not associated with boring old farts, back-scratching contractors and dodgy councillors, or in the case of my local area a few years ago, bent coppers and their hardened criminal buddies. I’ll tell you what though, there were some darned good tunes in THE MAGIC FLUTE. Something like ‘The Oul Orange Flute’ maybe! I was thinking of Cave Hill 1791.